Malcolm Atterbury and Harry Carey Jr. also receive a screen credit in the film's opening, but their scenes were deleted from the final film. Exteriors for the film were shot at Old Tucson Studios, just outside Tucson. Filming took place in the summer of 1958, and the movie's credits gave 1958 for the copyright; the film was released in March 1959. Rio Bravo is generally regarded as one of Hawks' best, and is known for its long opening scene which contains no dialogue. The film received favorable reviews, and was successful, taking in over US$5.5 million. Because the film starred a crooner, Martin, and a teen idol, Nelson, Hawks included three songs in the soundtrack. Before the big showdown, in the jail house, Martin sings "My Rifle, My Pony, and Me" (which contains new lyrics to a Tiomkin tune that appeared in Red River), accompanied by Nelson, after which Nelson sings a brief version of "Get Along Home, Cindy", accompanied by Martin and Brennan. Over the closing credits, Martin, backed by the Nelson Riddle Orchestra, sings a specially composed song, "Rio Bravo", written by Tiomkin with lyrics by Paul Francis Webster. Nelson later paid homage to both the film and his character, Colorado, by including the song "Restless Kid" on his 1959 LP, Ricky Sings Again. Members of the Western Writers of America chose "My Rifle, My Pony, and Me" as one of the Top 100 Western songs of all time. 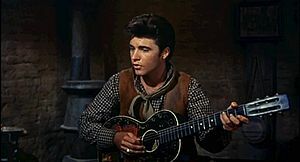 A brief clip from Rio Bravo was among the archive footage later incorporated into the opening sequence of Wayne's last film, The Shootist, to illustrate the backstory of Wayne's character. The film was made as a response to High Noon, which is sometimes thought to be an allegory for blacklisting in Hollywood, as well as a critique of McCarthyism. Wayne would later call High Noon "un-American" and say he did not regret helping run the writer, Carl Foreman, out of the country. Director Howard Hawks went on the record to criticize High Noon by saying, "I didn't think a good sheriff was going to go running around town like a chicken with his head cut off asking for help, and finally his Quaker wife had to save him." According to film historian Emanuel Levy, Wayne and Hawks teamed up deliberately to rebut High Noon by telling a somewhat similar story their own way: portraying a hero who does not show fear or inner conflict and who never repudiates his commitment to public duty, while only allying himself with capable people, despite offers of help from many other characters. 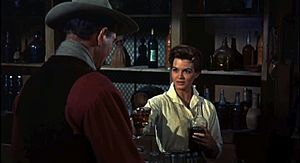 In Rio Bravo, Chance is surrounded by allies—a deputy who is brave and good with a gun, despite recovering from alcoholism (Dude), a young untried but self-assured gunfighter (Colorado), a limping "crippled" old man who is doggedly loyal (Stumpy), a Mexican innkeeper (Carlos), his wife (Consuelo), and an attractive young woman (Feathers)—and repeatedly turns down aid from anyone he does not think is capable of helping him, though in the final shootout they come to help him anyway. "Who'll turn up next?" Wayne asks amid the gunfire, to which Colorado replies: "Maybe the girl with another flower pot." In the United Kingdom, Rio Bravo was not originally even reviewed for Sight & Sound; Leslie Halliwell gave the film two out of four stars in his Film Guide, describing it as a "cheerfully overlong and slow-moving Western" that was nevertheless "very watchable for those with time to spare". The film was taken more seriously by British critics such as Robin Wood, who rated it as his top film of all time and wrote a book on it in 2003 for the British Film Institute, publishers of Sight & Sound. Pauline Kael called the film "silly, but with zest; there are some fine action sequences, and the performers seem to be enjoying their roles." It now has a 100% Rotten Tomatoes rating and was the second highest-ranking Western in the 2012 Sight & Sound critics' poll of the greatest films ever made. In 2008, the American Film Institute nominated this film for its Top 10 Western Films list. Howard Hawks went on to make two loose variations of Rio Bravo, on both occasions under a different title. Both of these remakes were directed by Hawks, both starred John Wayne, and in each case, the script was written by Leigh Brackett. All involve lawmen working against an entrenched criminal element, partially by "holing up" in their jailhouses. The first remake, El Dorado, was filmed in 1966, but it was not released in the United States (by Paramount) until the summer of 1967. In this film, Robert Mitchum played the Dean Martin role, Arthur Hunnicutt the Walter Brennan character, and James Caan the Ricky Nelson role. Hawks again named the Nelson/Caan character after a state (in this case, Mississippi) and in a wry, humorous twist on the original film, Hawks made him inept with firearms, but skilled with a knife. The second remake, Rio Lobo, was made in 1970 with a plot much further off the original mold, starting with the absence of a lawman-turned-drunkard character. This began with a Confederate train robbery of a Union gold shipment during the American Civil War, then moved to a postwar Texas county thoroughly controlled by a rich, arrogant rancher. The heroes, with the exception of an old man similar to Brennan and Hunnicutt's characters in the previous pictures (Jack Elam here), were complete outsiders. Along with Wayne and Elam, this movie starred Mexican film star Jorge Rivero (as Frenchie), Christopher Mitchum (Robert Mitchum's son), and Jennifer O'Neill. Feathers' dialogue was occasionally inspired by the character of "Slim" (Lauren Bacall) in the 1944 To Have and Have Not, as when, after the first kiss, she says: "It's better when two people do it," recalling the phrase "It's even better when you help;" and again later when she says, "I'm hard to get—you're going to have to say you want me," recalling Slim's "I'm hard to get, Steve—all you have to do is ask me." L'homme à l'étoile d'argent (The Man with the Silver Star), a 1969 album from the French comics series Lt. Blueberry was directly inspired by Rio Bravo. The plot is virtually the same. Blueberry plays the role of sheriff John T. Chance; McClure, a whiskey-adoring old man, combines the roles of Dude and Stumpy; Dusty plays the role of Colorado; Miss March, the teacher, plays the role of a less morally challenged Feathers; and instead of the Burdettes, it has the Bass brothers. John Carpenter's 1976 film Assault on Precinct 13, though not a remake of Rio Bravo, was inspired by the film. Carpenter borrowed some elements from the earlier film's plot, but set it in 1970s Los Angeles. He also paid homage to the original film by using the pseudonym "John T. Chance", the name of Wayne's character, for his editing credit. This film was also remade in 2005 by Jean-Francois Richet, starring Ethan Hawke, Laurence Fishburne, Gabriel Byrne, Maria Bello, Drea de Matteo, John Leguizamo, Brian Dennehy, and Ja Rule, moving the film's setting to Detroit. Ghosts of Mars, a 2001 film also by Carpenter, retains many of the elements that were developed in Rio Bravo and Assault on Precinct 13, but takes place in a science-fiction setting. The Nest, a 2002 film by Florent Emilio Siri, starring Samy Naceri, Benoît Magimel, Nadia Farès, Pascal Greggory, and Sami Bouajila, is a quasi-remake of Assault on Precinct 13. Borrachón: A Prequel to Rio Bravo, by Kevin Cullen, 2016. This book is a prequel to the Rio Bravo story and film and provides the complete background leading up to the classic tale. ^ Cohn, Lawrence (October 15, 1990). "All-Time Film Rental Champs". Variety. Penske Business Media, LLC. : M182. ^ "Cinematic Treasures Named to National Film Registry". National Film Preservation Board. Library of Congress. 17 December 2014. ISSN 0731-3527. Retrieved 4 August 2018. ^ Hawks, Howard (2006). Breivold, Scott, ed. Howard Hawks: Interviews. Univ. Press of Mississippi. p. 38. ISBN 9781578068333. ^ Commemoration: Howard Hawks' Rio Bravo, Warner Bros. DVD supplement. ^ The Handbook of Texas Online, Texas State Historical Association (retrieved on November 22, 2006). ^ "Un dollaro d'onore". Wikipedia (in Italian). 2016-10-31. ^ Munn, Michael (2005). John Wayne: The Man Behind the Myth. New York: Penguin. p. 190. ISBN 0451214145. Retrieved 1 February 2015. ^ Manfred Weidhorn. "High Noon." Bright Lights Film Journal. February 2005. Accessed 12 February 2008. ^ a b Stafford, Jeff. "Rio Bravo". TCM Film Article. Turner Entertainment Network. Retrieved 1 February 2015. ^ Levy, Emanuel. "High Noon: Why John Wayne Hated the Film". Cinema 24/7. Retrieved 1 February 2015. ^ Halliwell, Leslie (1979). Halliwell's Film Guide to 8,000 English Language Films, Hart-Davis, MacGibbon, Granada. ^ "Critics' top 100". British Film Institute. 2012. Retrieved December 12, 2016. ^ "Dell Four Color #1018". Grand Comics Database. Byman, Jeremy (2004). Showdown at High Noon. Metuchen: Scarecrow Press. ISBN 0-8108-4998-4. McCarthy, Todd (2000). Howard Hawks. New York: Grove Press. ISBN 0-8021-3740-7. Roberts, Randy (1997). John Wayne. Lincoln: University of Nebraska Press. ISBN 0-8032-8970-7. Wood, Robin (2006). Howard Hawks. Detroit: Wayne State University Press. ISBN 0-8143-3276-5. Wood, Robin (2003). Rio Bravo. London: BFI Pub. ISBN 0-85170-966-4. Wikimedia Commons has media related to Rio Bravo.